A caveat: This translation intentionally follows English syntax more than ASL syntax because it was made to be used in a research study (i.e. it is PSE and not pure ASL). 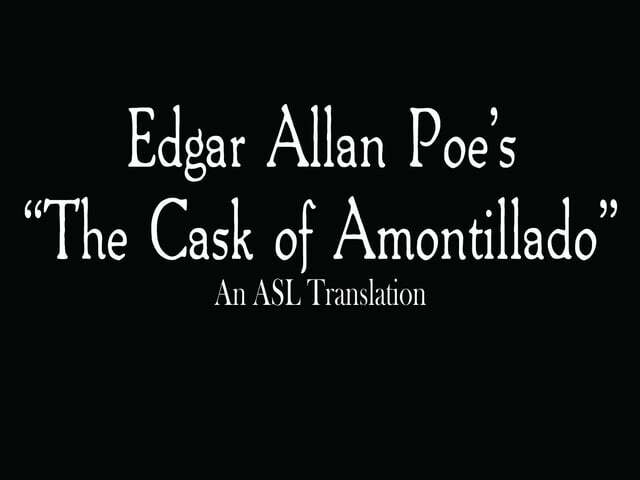 This is one of the short stories that I would love to re-do someday without the limitations I had in translating it the first time around, but for now, I'm posting it as it is anyway because "The Cask of Amontillado" is one of my favorite Poe stories. (1846)THE thousand injuries of Fortunato I had borne as I best could, but when he ventured upon insult I vowed revenge. You, who so well know the nature of my soul, will not suppose, however, that gave utterance to a threat. At length I would be avenged; this was a point definitely, settled --but the very definitiveness with which it was resolved precluded the idea of risk. I must not only punish but punish with impunity. A wrong is unredressed when retribution overtakes its redresser. It is equally unredressed when the avenger fails to make himself felt as such to him who has done the wrong.